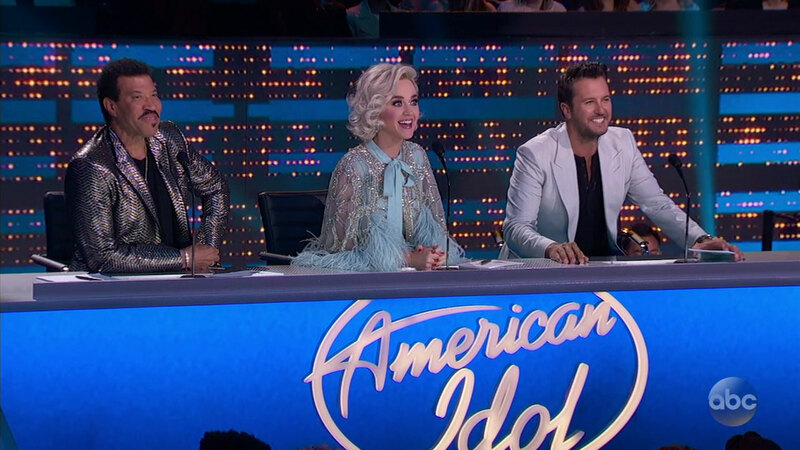 "American Idol" is closing to naming its winner for this season with the two-part finale this week. LOS ANGELES -- The journey to find the next superstar came to a head in part 1 of the two-night season finale as the top three performed during a tight contest of "American Idol." Round 1 saw the top three finalists visit their hometowns in Georgia, Pennsylvania, and Iowa to celebrate their time on the show. They later returned to the stage for their last chance to win America's vote. Caleb Lee Hutchinson, Gabby Barrett and Maddie Poppe had their work cut out for them this round, performing three songs each: a hometown dedication, a repeat of their favorite song of the season and their (hopefully) winner's single. Fans get to vote overnight on Sunday, May 20, to determine who will be crowned the next "American Idol." Voting for the finale is open until 6 a.m. PT on Monday, May 21. The winner's single selected for Gabby is called "Rivers Deep." Before she sings, we see her final mentoring session with syndicated radio host Bobby Bones. When she tells him she'll move to Nashville whether she wins or not - and bring her biggest fan, Dad, with her - Bobby advises her to cut the cord and do it on her own. The judges don't love the song; but they all agree that sometimes you have to sing a song the crowd is unfamiliar with and you just have to sell it. Lionel Richie was the most specific with his advice, telling her why song selection is so important, and told her to select a song that works on the stage, and then work back to one that works in the studio. Gabby revisited Miranda Lambert's fun song "Little Red Wagon" and it let her show off her personality a lot more than the first winner's song. Afterwards it caused Katy to smile, and pause, and simply say "there she is!" Lionel enjoyed seeing her more relaxed and owning the stage. And Luke reminded Gabby, and all the finalists, that this is not the time to tighten up... bring it! Before Gabby channels her inner rocker for a rousing rendition of "Don't Stop Believin'," the Journey classic, she is overwhelmed by the reception she receives in Pittsburgh. Tearful visits with family and friends lead to a live concert with the hometown crowd. But the capper was after her performance on the Idol stage - former Journey frontman Steve Perry praised her version of their hit song. Caleb talks to Bobby Bones about the dog tags he wears, with much affection; they belong to his great uncle, who was an early supporter of Caleb's music. His winner's single is a tried-and-true country ballad called "Johnny Cash Heart." Lionel Richie gave him a verbal "high five" and said welcome to the business. But Katy Perry gave her brutally honest opinion of the performance and said she felt it was his weakest of the run. Luke Bryan agreed, and told Caleb he thought he looked and sounded a little weak and tense with this song. Caleb's repeat song was the Keith Whitley classic "Don't Close Your Eyes," which he first sang during Hollywood week. The judges breathed a sigh of relief that the Caleb Lee they've grown to know and love was back on stage: confident and solid. The hometown song Caleb chose was a Johnny Cash classic, "Folsom Prison Blues." But before the song... the fanfare. The TV and radio visits. The parade. The celebration at his high school. Pretty darn overwhelming! He handles it all with grace and humility. Bobby Bones is blunt with Maddie and lets her know that even if she wins "American Idol," she might still be playing a lot of venues for free. There's a long road ahead! He also asked her if she felt more confident and Maddie shared she's happy that America has accepted her unique style and that alone feels like "winning." Her winner's single is called "Going Going Gone" and all three judges felt that this was the best fit of all the finalists. Bryan said she looked comfortable on stage, and that made him relax and feel comfortable watching her. Richie reminded her that, moving forward, she's now in the sales business and she has to "sell" each song. Perry looked further into the future, and said while "Idol" keeps them in a bit of a bubble, what they really want to do is prepare them for the business so that when they leave this next they will all be able to spread their wings and fly. Maddie did an original song for her "repeat": "Don't Ever Let Your Children Grow Up." Both Luke and Lionel were happy to hear and see her original style again. Katy was happy Maddie took the risk of doing an original song, which reminded people that she's also a songwriter, the full package, and "authentic as heck." A visit to Clarksville, Iowa, was just as emotional for Maddie as it was for her fellow finalists. She went to a very small school, but the student body turned out in force, and sang her signature "Muppets" song with her and forged a true "Rainbow Connection" with the kids. She sang "Landslide" by Fleetwood Mac and her version had Luke say a performance like this was the reason he signed up for the show. Katy picked up her phone right then and there and told Maddie "I'm voting for you." There's one more round of "American Idol." We'll crown a winner Monday night!